They say that twins can feel each other's feelings and hear one another's thoughts...so why won't Jill leave Jack alone?! He doesn't want her around, thinks she's annoying in every way (which she is) and drops hints left and right that he'd rather she wasn't staying at his house. But when she proves useful to help him keep his biggest customer at work, suddenly he might just have room in his life for her...maybe. It's hard to decide who to blame for this terrible little movie. Director Dennis Dugan or Adam Sandler himself for his work on the screenplay? I'm gonna play it safe and just blame pretty much everyone who was ever involved or thought about being involved in the creation of this 'film'. It wasn't funny. It was choppy with zero flow and made no sense in the sequence of scenes. I imagine that if you gave a 10 year old kid millions of dollars worth of camera equipment and a year's supply of Adam Sandler jokes that the outcome would be the same. The best part of the whole movie was the twin takes at the beginning and the end. Motherly Advice: Unfortunately, with my filters set to Medium I still saw most of this movie. Too bad ClearPlay can't filter idiocy. 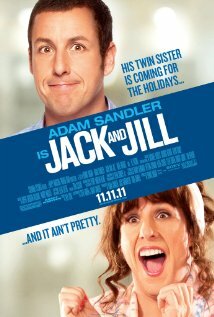 What you'll want to be careful of even with filters set is a scene where Sandler puts an ad out on the computer to lure desperate men to respond to Jill's single's ad. It's a bit on the suggestive side. Another scene we see Al Pacino's character tickling Jill under the armpits and I'm sorry but it was just a bit uncomfortable for me. For Adam Sandler this one was fairly clean and with your filters set to Medium for some suggestive language and blasphemy this one could be suffered through by ages 11 and up.